The E-4B, which serves as the National Airborne Operations Center (NAOC) and is a key component of the National Military Command System for the president, the secretary of defense, and the Joint Chiefs of Staff, transferred from Air Combat Command to Air Force Global Strike Command. The Air Forces' four E-4Bs, which are based out of Offutt Air Force Base, Nebraska, were commemorated during a transfer ceremony 07 October 2016. To improve central management of the nuclear enterprise, Air Force Secretary Deborah Lee James and former Air Force Chief of Staff Gen. Mark A. Welsh directed that the Air Force create an organization with a clear line of communication between the president and members of the nuclear task forces. Air Force Global Strike Command was designated as the Air Force lead for nuclear command, control and communications (C3). The E-4B serves as the National Airborne Operations Center (NAOC) for the National Command Authorities. In case of national emergency or destruction of ground command control centers, the aircraft provides a modern, highly survivable, command, control and communications center to direct U.S. forces, execute emergency war orders and coordinate actions by civil authorities. There are only four E-4B aircraft in the Air Force inventory, with one constantly on alert. The E-4B National Airborne Operations Center supports the National Command Authority (NCA) and the Chairman Joint Chiefs of Staff (CJCS). Other responsibilities include a worldwide, survivable enduring node of the National Military Command System (NMCS) for the purpose of exercising national security responsibilities throughout the full spectrum. of conflict. Offutt AFB, NE serves as the ACC E-4B Main Operating Base (MOB). Offutt AFB provides full organizational level maintenance with limited intermediate level maintenance support. Higher headquarters and training missions are flown from Offutt AFB. The E-4B has numerous Forwarding Operating Bases (FOB) throughout the United States. Higher headquarters and training missions are flown from these FOBs. The FOBs have limited organizational level maintenance capability and no intermediate level maintenance. Maintenance support is provided by a deployed 1 ACCS maintenance team. Air Combat Command (ACC) is the Air Force single-resource manager for the E-4B, and provides aircrew, maintenance, security and communications support. 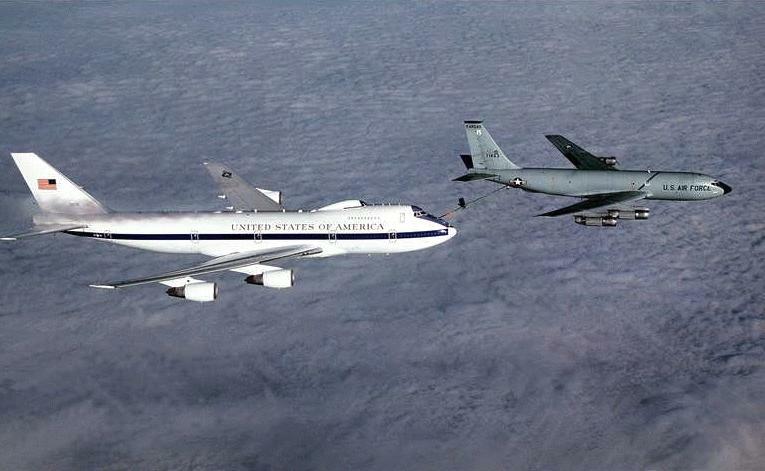 The Joint Chiefs of Staff actually control E-4B operations and provide personnel for the airborne operations center. 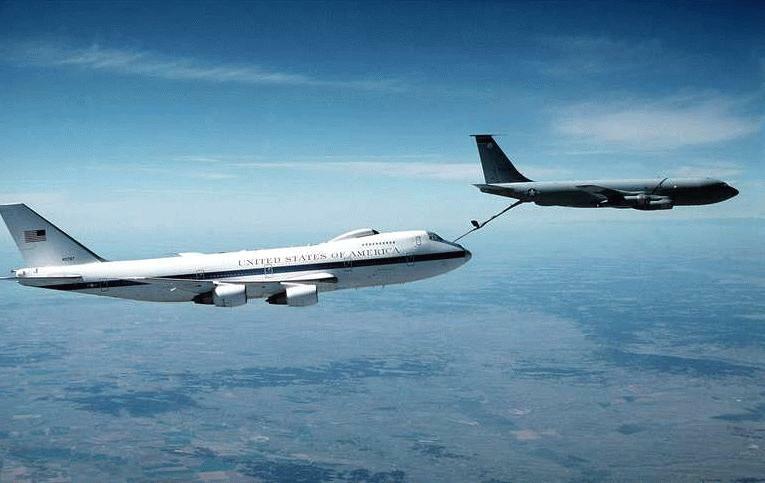 The E-4B, a militarized version of the Boeing 747-200, is a four-engine, swept-wing, long-range, high-altitude airplane capable of being refueled in flight. Its larger size provides approximately triple the floor space of the earlier EC-135 command post. The main deck is divided into six functional areas: a National Command Authorities' work area, conference room, briefing room, an operations team work area, and communications and rest areas. An E-4B crew may include up to 114 people, including a joint-service operations team, an ACC flight crew, a maintenance and security component, a communications team and selected augmentees. The E-4B has electromagnetic pulse protection, an electrical system designed to support advanced electronics and a wide variety of new communications equipment. Other improvements include nuclear and thermal effects shielding, acoustic control, an improved technical control facility and an upgraded air-conditioning system for cooling electrical components. An advanced satellite communications system improves worldwide communications among strategic and tactical satellite systems and the airborne operations center. To provide direct support to the National Command Authorities, at least one E-4B is always on alert at one of many selected bases throughout the world. The E-4B requires numerous improvements to maintain flight worthiness and improve command, control, and communications capabilities. The next near-term major improvement is a Block 1 modification and includes an Audio Infrastructure Update, Global Air Traffic Management compliance updates, and the Senior Leadership Communications System. 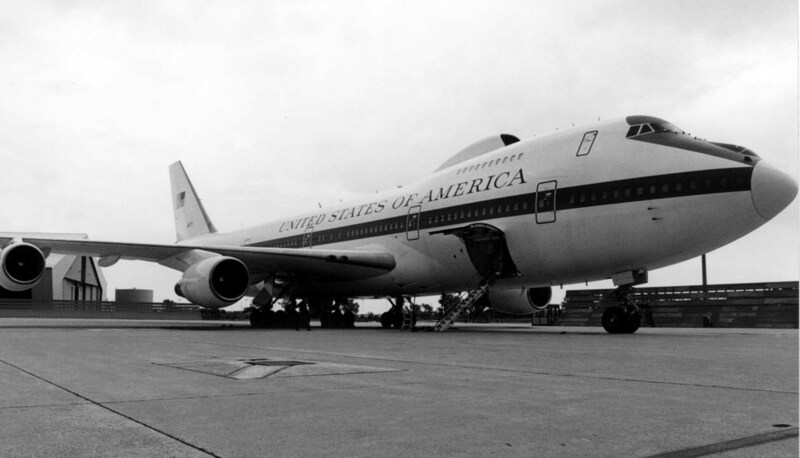 The E-4B evolved from the E-4A, which had been in service since late 1974. The first B model was delivered to the Air Force in January 1980, and by 1985 all aircraft were converted to B models. 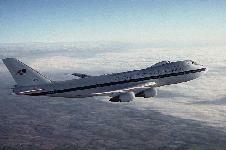 All E-4B are assigned to the 55th Wing, Offutt Air Force Base, Neb. In August 1994, the E-4B assumed an additional role. 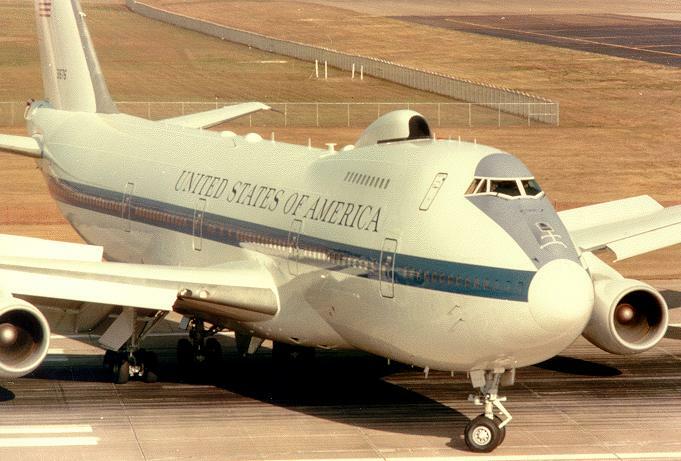 With the approval of JCS chairman, the E-4B will support the Federal Emergency Management Agency's request for assistance when a natural disaster, such as hurricane, typhoon or earthquake occurs. 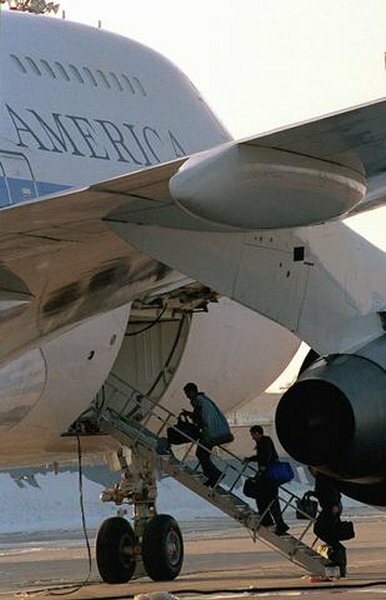 The E-4B would be tasked to fly the FEMA Emergency Response to the disaster site, and become the FEMA command and control center until the emergency team's own equipment and facilities can be set up. 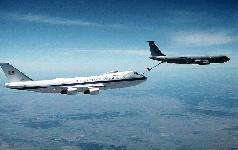 With E-4B support the emergency team's response is a matter of hours as opposed to days.